Written for Runner’s Tribe & The Source by Sam Burke – Veterinarian, BVMS. Lonely on those long runs? Want a training partner who doesn’t speak? Sounds awesome right?! A well-trained dog might be just what you are after. But buyers beware, not many dogs can handle long runs over hilly terrain, on a consistent basis. I’ve read a lot of articles which list the best dogs for endurance running (not sprinting). As a veterinarian, I tend to disagree with many of the dogs listed in these articles. Vets are the ones who see the dogs when they pull up lame and require new hips or stifle (knee) surgery for cruciate ligament ruptures. Labrador Retrievers, German Shepherds, Boxers, Beagles, and Golden Retrievers are commonly listed as ideal endurance running partners. I am sure there may be some exceptions here, but as a whole these breeds can’t handle 90-minute runs at a brisk pace over rough terrain. And if they can, their longevity will be limited. Their hips, stifles, or carpal (wrist) joints will soon give way. 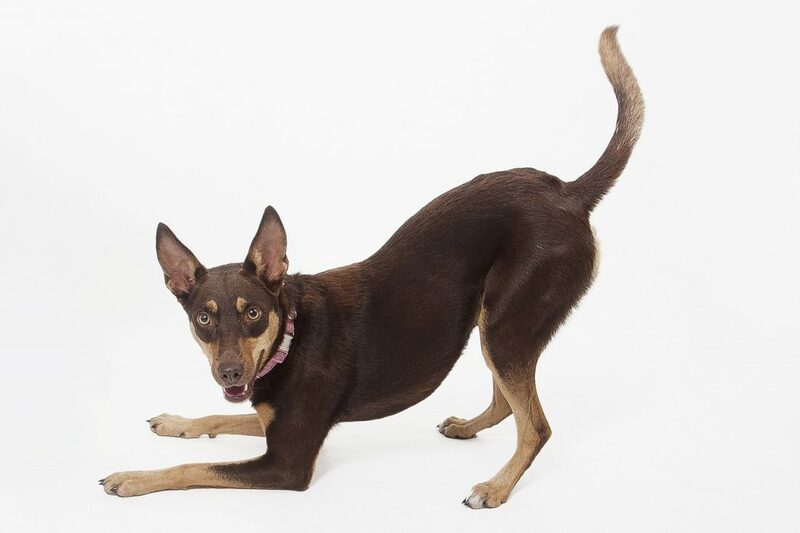 Running tends to unravel our biomechanical weaknesses and amplify them; dogs are no different and when you take a dog with underlying hip dysplasia or stifle biomechanical abnormalities, you are asking for trouble. Orthopaedic surgery or long term use of anti-arthritis medications will more than likely be the result. But there are many breeds that are incredibly hardy, that can handle 120km weeks or more, and rarely seem to break down with injury. Obviously there are, once again, exceptions. 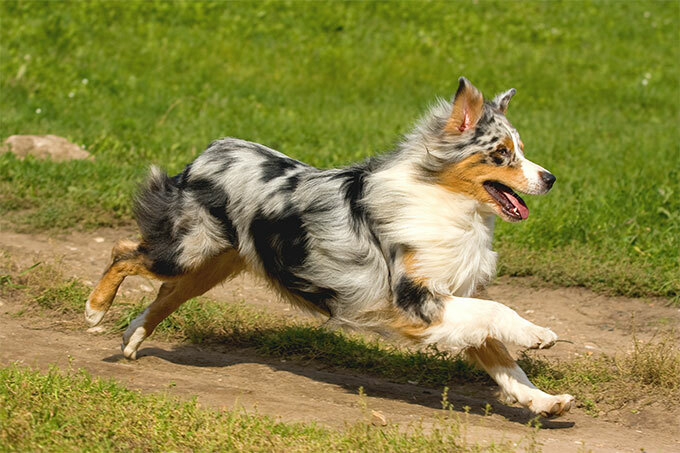 There are countless medical problems any breed can suffer from which will limit their running abilities. But as a general rule, the below breeds will serve you well during your tough, hilly, rocky, endurance runs. Note: I have listed purebred dogs below for obvious reasons. Generally speaking, crosses of any of these breeds would also most likely result in awesome endurance running pooches. From a genetic perspective, 99.999% of veterinarians would advise a cross-bred dog over a purebred. 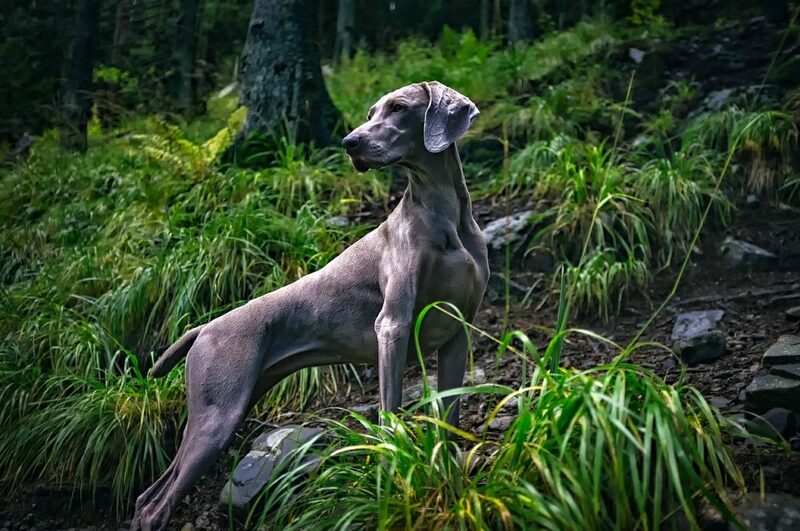 Weimaraner’s were made to run. Whether it’s short, quick bursts or long distances. With a short coat they are not as susceptible to overheating as many other breeds. They are tough on rough terrain and trails, and tend to be fearless. Their only weakness is that some can be a little anxious, but with proper training this shouldn’t be an issue. Border Collies belong on farms. But if you, like many, are determined to have a Border Collie, I sure as hell hope you are a good runner, as these guys will run many of our country’s best runners off their feet. Some Border Collies are born with genetic carpal (wrist) abnormalities which can predispose to arthritis, but if you can avoid that, then good luck trying to keep up. 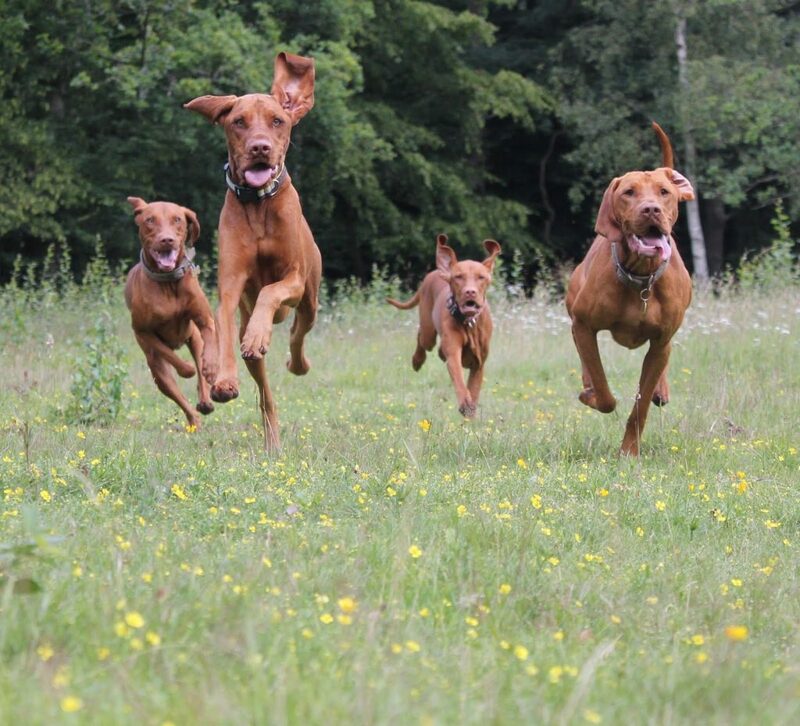 Vizsla’s are amazing athletes. Probably my favourite running dog. 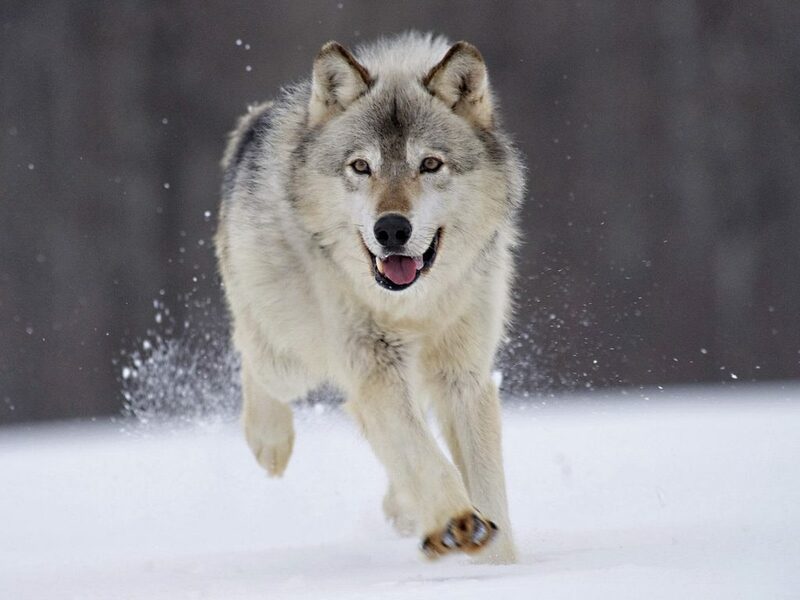 They are amazing runners (speed and endurance), they can jump, navigate, and they are incredibly easy to train. Their short coat is ideal for temperature control and they are as loyal as can be. If there is a perfect breed, this is it. 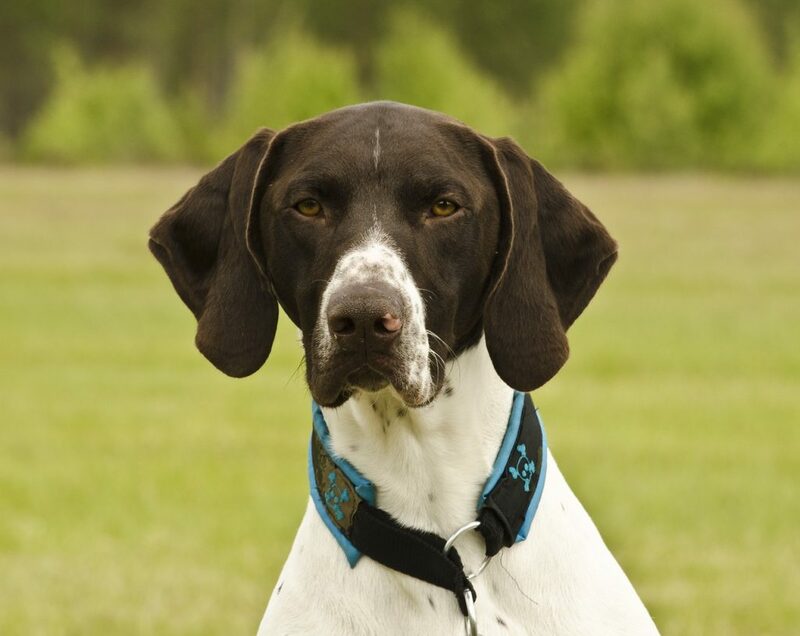 Bred for hunting, German shorthaired pointers (GSP’s) are true endurance athletes and require a lot of exercise. They are the sort of breed that seems to get stronger the longer the run goes. Some GSP’s can be a little anxious, but this tends to not be a problem when they are both well exercised and well trained. Their short coat is perfect for temperature control. I have a mate who ran 2:23 at the Boston marathon a few years back. For the 6 months leading into the race his trusty Australian Kelpie did every training run with him. Another farm dog, they are as tough as nails, easy to train and so loyal they make you feel guilty when you look at another dog. 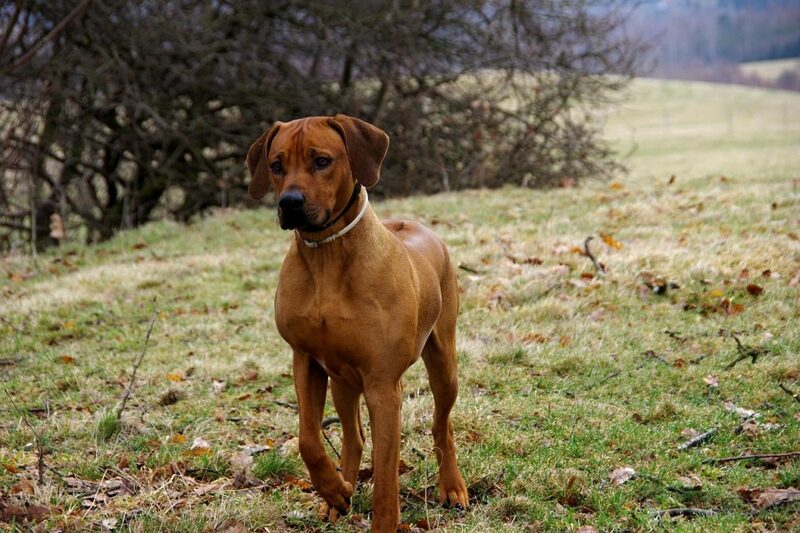 Rhodesian Ridgebacks were bred many years ago to hunt lions in Africa, so naturally they are pretty decent runners. I’ve seen a lot of snappy, aggressive Ridgebacks, but this is more often than not the result of idiot owners, so let’s not hold that against them. When in a good home, these dogs are just beaut. Another dog that belongs on a farm. These dogs were actually bred in the United States, but hey, they obviously prefer to be called Aussies, damn smart dogs I say. These dogs can run all day. Their only downside is their longer coat can lead to overheating on those really hot days. 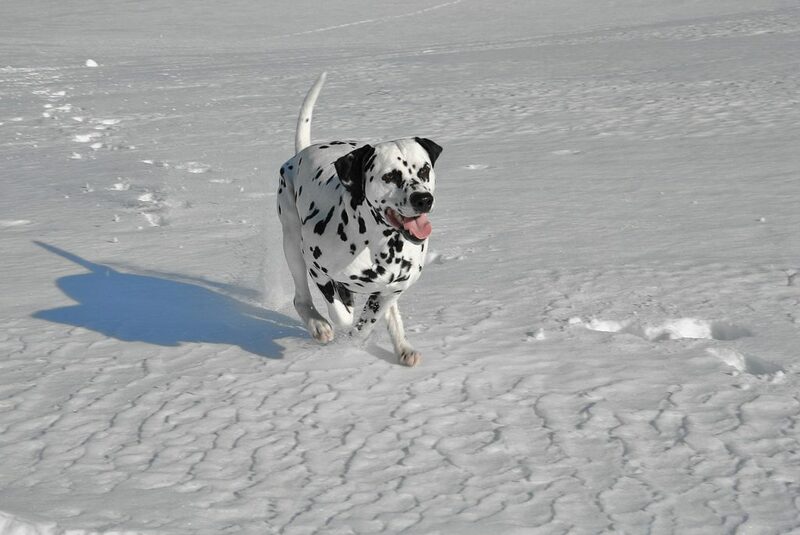 Dalmatians are awesome runners if well looked after. They tend to land heavier than many of the other dogs listed and are therefore more suited to trails than the road. Their short coat is ideal for temperature control. As a general rule having Siberian Huskies in hot climates is pretty stupid and at times cruel. As the name suggests, these dogs were bred in Siberia, yes, Siberia. Their thick coats were thus designed to keep them warm, in SIBERIA. But alas, these dogs are popular, and the fact that they can run all day is undisputable. I think a perfect solution is to keep their coat short by getting them groomed on a regular basis. Don’t believe anyone who tells you it’s cruel to groom them, I mean just think about it for a second, a groom is just a haircut, and I tend to think that dogs aren’t overly vain. 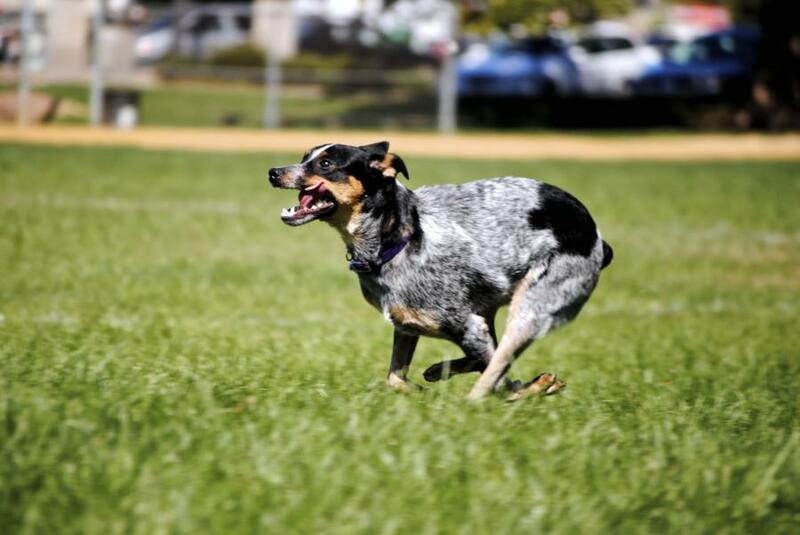 I’ve seen a lot of Australian Cattle dogs with hip and stifle problems, so a cross-bred Cattle dog is preferable. But if you are lucky enough to get one with fortunate genetics, then these dogs are awesome for long, steady runs. A little shorter and compact than many of the breeds listed above, but don’t let this fool you, they are machines. There are many other breeds that can cover a marathon no problem. Some Belgian Shepherds and various other Shepherd breeds, English Setters, Staffordshire Terriers, some Whippets and Italian Greyhounds, some Malamutes, some Spaniels, some Jack Russell’s for example, and various other breeds. But the above list is a good place to start. The Ice Bath has long been associated with recovery from running. The theory goes that the cold water helps to reduce inflammation in our sore and beat-up muscles. Fortunately, it looks as though recovery from your marathon training may be a lot more enjoyable. Running is hard enough as it is, so adding in 10-minutes of sitting in freezing water afterward is not very enticing. Studies actually now show that markers of inflammation and potential soreness are not reduced by cold-water.Still, it remains popular with athletes of all abilities. Research out of Sweden has indicated that heating your muscles can aid in recovery, while the old method of cooling actually slows the process down. The only catch is that you have to eat first. Food, then sit in a hot tub… Sounds good, right? One of the main reasons that our muscles give out is that they run out their fuel: glycogen (a substance deposited in tissue as a store of carbohydrates), so tests were done to determine whether or not temperature affected how much glycogen our muscles can absorb before being used again. It turns out that muscles recovered faster and were able to regenerate power after they had been exposed to heat, but only if they had first been refuelled with glycogen after exercise. 30 minutes after running is a great time to replenish muscle glycogen stores and get rehydrated. A favourite amongst marathon runners is chocolate milk given its 4-to-1 ratio of carbs-to-protein. If you’ve currently in the midst of training for a marathon and are sore after a particularly tough run, then treat your aching legs to a hot bath or head to a hot tub/sauna. The recovery will help you bounce back faster and get the most out of your next run or race. Performance in a marathon is about controlling the controllable. Train hard, recover well and the variables associated with fitness are minimised. Practice pace judgement and the likelihood that you reach your goal begins to increase. Fuel and hydrate properly and you maximise the chances of avoiding ‘the wall’ or the myriad of other names associated with struggling through the last 10-12km. Fuelling is a strategy of supplementing the bodies diminishing glycogen stores throughout long distance racing. There are two sides to the coin of fuelling: hydration and carbohydrates. The key is maximising the bodies ability to utilise both, so absorption and availability is king. The general consensus in the scientific community is that the body generally has enough glycogen ‘on board’ to get you to around 75-90 minutes of hard running. However, by implementing an effective hydration and carbohydrate protocol, gains can be anywhere from 2-15% based on where you’re racing. 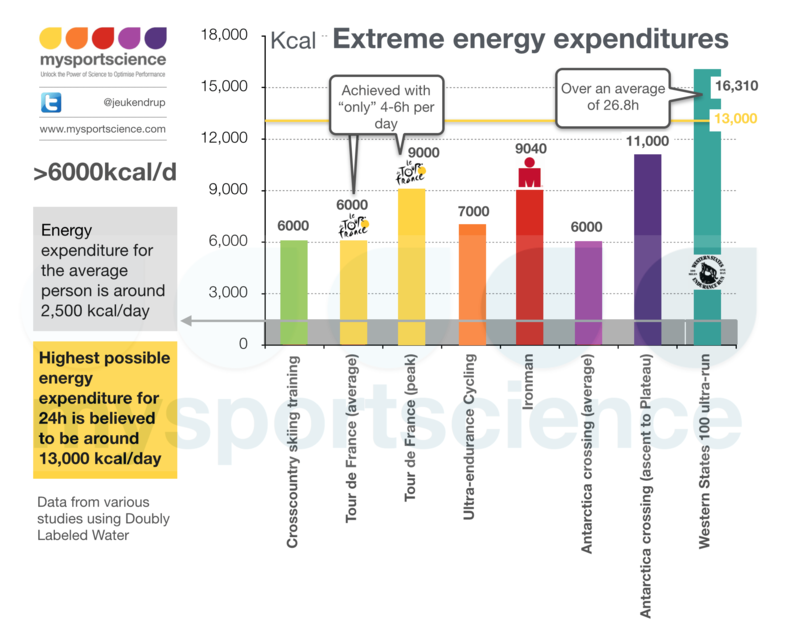 When it comes to fuelling for the marathon there is plenty of conflicting information floating around, yet there are a few in the scientific community that (a) specialise in this area (b) are runners themselves and work with elites. One of the few to be (c) all of the above, is Trent Stellingwerff. Stellingwerff provides physiology and nutrition expertise to Canada’s national rowing, track & field and triathlon teams, as well as leading their Innovation and Research division. He is currently one of the leading-brains in the field, and below we have implemented some of his recommendations into a guide for any race where you’re likely to be on your feet for longer than those 70-90 minutes. SOS athlete Patrick Rizzo finishing the London Marathon in 12th place. April, 2013. Rizzo has found that without effective fuelling & hydration he is unable to get the most out of his fitness and regularly practices taking on fluids in training. The traditional fuel of choice for many marathoners has been gels. More recently, many athletes have started to utilise carbohydrate-dense drinks such as Maurten. Although there are some useful ‘general guidelines’, we all have different needs, so it’s always a good idea to complete a bit of an amateur sweat test during training. It is as simple as it sounds: track your weight pre and post run. The metric system makes this a lot easier as 1L of sweat is equal to 1 Kg of body weight. Ideally you will end up somewhere between the 2-5% range. That will give you an idea of how much fluid you will need to get down to keep the tank running. Try it across varying types of weather and distances to get a bit of an idea of how your body is working to keep itself cool. Laura Thweatt successfully implemented her favourite Mango SOS as a key part of her fuelling for the NYC Marathon in 2015 where she was 1st American. Not all gels and drinks are created equal, and neither are all sugars. Stellingwerff recommends a blend of glucose and fructose, with studies indicating that this allows between 20-40% greater absorption and delivery of carbohydrate over glucose alone. This is because there are separate transporters for glucose and fructose in the intestine, meaning that a glucose/fructose blend of around 2:1 results in increased uptake of carbohydrate and more delivery to the muscles. Various brands of gels and drinks offer a wide range of consistency and viscosity that is all a matter of personal preference. What is important is the glucose/fructose ratio. Look for maltodextrin (which is glucose as well) or sucrose and fructose as the first two ingredients. The ‘Rule of 15’ is basically consuming something close to 15 grams of carbohydrate every 15 minutes and 150 mL of fluid. Don’t overthink the exact numbers, the key is being there or there about over the course of an hour (ish), which is around 60g per hour of carb’s and 600 mL of fluids. In order to limit GI distress and maximise absorption while also working to the guidelines above, we have found that it’s a good idea to separate your fuel and hydration. Rather using a generic sports drink that is trying to be both, alternate SOS and a gel or drink such as Maurten at each available station. This way you can let your body focus on one thing at a time while still getting your fuel requirements. Separating hydration and fuel also allows for a greater ability to modify consumption based on weather without sacrificing glycogen intake. If it’s hot, you can drink more and vice versa. Hydration needs can vary; glycogen requirements do not. Take your time with your fluids; you don’t need to get your whole bottle down in 30 seconds. It’s not uncommon to see those at the top end of the field sipping over the course of a kilometre. It’s easier on the GI system and settles with less distress. Running is fast can be hard, and drinking while running fast is even harder. With that in mind it’s important to practice your fluids in training as much as is feasibly possible. Set up a foldout table or put bottles on the hood of your car. If you’re carrying bottles, practice long runs and workouts with your fuel belt or bottle in hand. If you are leaving hydration purely up to what the race provides, try and get as efficient as you can with drinking out of paper cups. Don’t let all the training you have done fall apart because of an inadequate fuelling strategy. You can be as fit as you have ever been, but if the pump from the engine to the tank isn’t working optimally you will almost certainly run below your ability. Written by Nancy Hobbs & Lin Gentling. Photos by Richard Bolt. Today’s USATF Half Marathon Trail Championships in Hayward, Wisconsin, saw a familiar face in Joseph Gray winning his 13th national title. The 33-year-old from Colorado Springs, CO, bested a competitive field to take the win with a time of 1:10:11. Joe Gray leads at the start of the USATF 1/2 Marathon Trail Championship. TRY JOSEPH’S FAVOURITE MANGO SOS HERE! This post was written by David McNeill for Runner’s Tribe – an SOS HYDRATION partner. Too often in my career, I have walked off the track querying my performances; wondering why I ran so poorly when training pointed to something better…or wondering how on earth I ran as fast as I did when preparations had been poor. The latter scenario has never been so much a concern as it has been a blessing. But in the case of the former, I was always left wondering what it is I did to sabotage my performance; why, despite my best intentions, my performance didn’t improve from one race to the next. I’d like to say the days of unpredictable performances are behind me, but I am human, and I am sure unexplained performances lie in my future. At some point or another, many of us have run a great race, fed off the motivation of that performance in preparation for the next race, and then run poorly that next time around. Why don’t we improve sometimes? Why don’t races always live up to expectations? What is it we do to sabotage training and performance gains? Being overzealous is one factor. While it is sometimes easy to equate harder training with better performance, we sometimes jump the gun, and think training harder is the only answer, when often, the first answer is to be consistent. Imagine giving a lemon a squeeze, and getting some juice out of it. Rarely do you get all the juice out of the lemon with a single squeeze. More juice is yielded when we start to wring the lemon. Just as we wouldn’t fetch another lemon before we’d squeezed all the juice out of it, sometimes, we need to keep training consistently before we start training harder.When we prematurely start to train harder, the balance between stress and adaptation is shifted, and we do not recover and adapt at the rate at which we are stressing our bodies. When we train consistently after already seeing improvement, subsequent improvement with the proverbial wringing of the lemon is actually a product of our body’s ability to recover faster and more fully from training, so that we adapt quicker and more completely with each training session. Of course, the time comes when the lemon is dry, and you will need to fetch another. Learning when to be consistent and when to train harder represents the art of coaching and training. Overcompensating for small hiccups in our preparation can also bring us undone. When we miss a session or when a session doesn’t go well, we sometimes feel the need to compensate by squeezing the missed training into a smaller window of time, or pushing harder than usual in the next workout. This ends up being detrimental in two ways: one is that often, in our haste, the body is not fully recovered from the illness or niggle that initially caused the hiccup when we overcompensate our training. Secondly, by temporarily training too hard or too frequently, we upset our body’s sensitive balance between stress and adaptation. Compensating often has the opposite effect we seek when a niggle, an illness, or a time constraint disrupts our training. Instead of catching ourselves back up in the training we miss, compensating drives us further from where we are trying to get, and sabotaging our ability to improve, even when gains have otherwise been made. But as is the remedy for the hiccups we experience when our diaphragm spasms, the key to navigating hiccups in our training is to take a deep breath; not to compensate, but to accept, recover, and move on. While a hiccup may hinder our progress marginally, compensating irrationally can hinder our progress substantially. Stay cool. Another factor that can curtail improvement with training gains is the perception that running faster gets easier with more training. “Train hard, win easy” is a deceptive saying. With training, our capacity to physically endure oxidative stress and the build-up of metabolic by-products improves, but it’s still uncomfortable, and the closer to our physical limits we approach, the more perceptible this discomfort is. While running equally fast may get easier with more training, running faster continually necessitates submitting to discomfort. When we ignore this truth, we can end up blaming everything from our training, to our diet, to our sleep for a lack of improvement, without every questioning our resolve at the crossroad between comfort and discomfort come race time. At the outer margins of our human capacity, when improvements become more marginal each time we get better, increasingly, our improvements rely on our ability to endure more discomfort for longer, than on our ability to get physically fitter. When our supply of lemons dwindles at the limits of our human capacity, we are spending a lot more time wringing out those lemons. We are trying to get the last drop of juice out of them before contemplating fetching another lemon; before contemplating training any harder, and increasing our injury risk. Wringing the last drop of juice out of a drying up lemon is a kin to enduring more discomfort at our physical limits – the juice is there, but we must work for it and endure it, unlike the first early squeeze of a fresh lemon. I myself am guilty of all three sources of sabotage. And when I have performed better than my training indicated, it was probably because I was a little underdone rather than overdone. Avoiding sabotage is both a delicate mental battle we have with ourselves, and a carefully learned art that comes from experience – both our own, and our coach’s. The best combatant to sabotage is thinking less, and listening more. Most often, sabotage happens when we make irrational decisions – when we are over motivated, when we are thrown off by the unexpected, or when we are overconfident. Half the battle is recognising when we are over-motivated, overconfident, or thrown by the unexpected. The second half of the battle is finding someone you trust (i.e. a coach), and seeking a dose of perspective! NEW YORK (10-Sep) — Experience counts on 5th Avenue. Jenny Simpson and Nick Willis proved that here today with emphatic wins down the famed New York City boulevard. 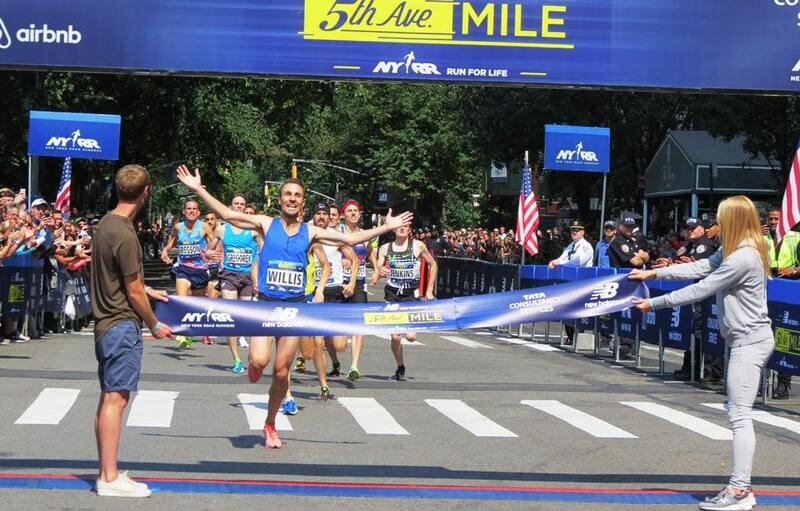 Simpson scored a record sixth title at the New Balance 5th Avenue Mile shortly after Willis notched his fourth victory in the event, staged by New York Road Runners on a picture-perfect day. With the temperature at 70 degrees, low humidity and a generous wind at their backs, both the men’s and women’s professional races were exceptionally fast. Willis broke the tape in 3:51.3 while Simpson clocked 4:16.6 to equal the venerable event record set by PattiSue Plumer back in 1990. Engels opened up a gap on the field during the third quarter as the road sloped down, but he was swallowed by the pack shortly after the three-quarter mile mark (2:56). Brits Chris O’Hare and Jake Wightman surged ahead, but Willis smoothly positioned himself towards the center of the pack, before launching a perfectly timed kick in the final 100 meters to grab the win. 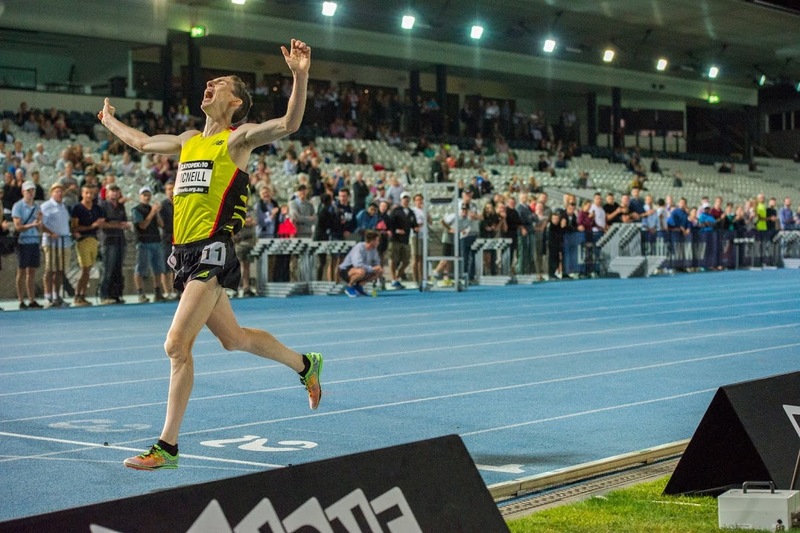 “I think I ran over one of the manhole covers with 30 [meters] to go and I was already at my max so I was worried that I was gonna fall over there,” said the 34-year old New Zealander, who previously won this race in 2008, 2013 and 2015. O’Hare (3:52.0) held on for second, ahead of Ben Blankenship (3:52.3), with the next five runners separated by only three-tenths of a second and a total of 19 men clocking sub-4:00 times. A two-time Olympic medalist in the 1500, Willis placed a disappointing eighth at the recent IAAF World Championships in London. “This was a great way to finish what has been a pretty trying season for me with a lot of hiccups with injuries along the way,” he said as he points to the 2018 Commonwealth Games in April where he is likely to move up to the 5000-meters. Simpson took a more assertive strategy than Willis, immediately going to the front of the women’s race. A pair of Brits, Laura Weightman and Jessica Judd, quickly joined her up front through a 62-second opening quarter. Nobody seemed terribly eager to snag the halfway bonus, so Judd made a last-second decision to go for it, splitting 2:10 and picking up the extra cash (which she says she’ll put towards her upcoming vacation to Hawaii). 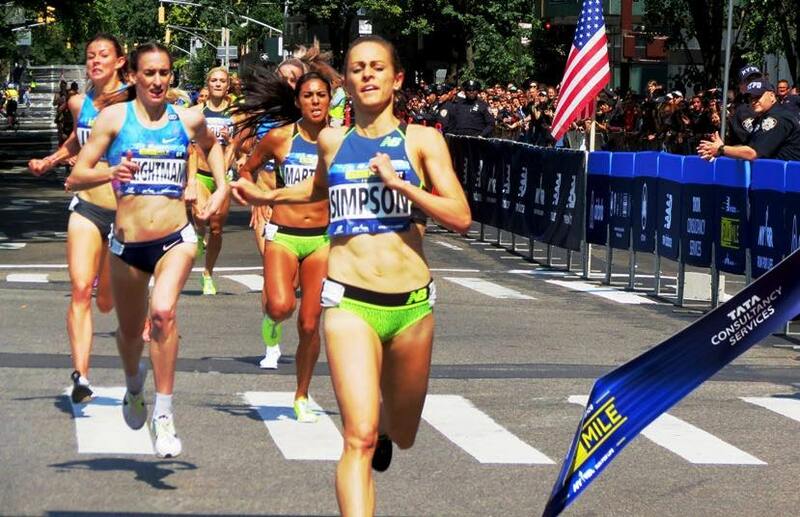 She continued to force the pace until Simpson and Weightman caught her about 200 meters from the finish. The American cruised home comfortably, with Weightman taking second in 4:17.6 and Judd holding off a late-surge from Brenda Martinez for the final podium spot, 4:18.3 to 4:18.4. In a mass finish similar to the men’s event, 16 women broke 4:30. Simpson will resume training after a 10-day break, and this fall she’ll take her first vacation since 2010 when she and her husband, Jason, spend a week in Hawaii prior to the wedding of her friend Emma Coburn, who finished ninth on Sunday. 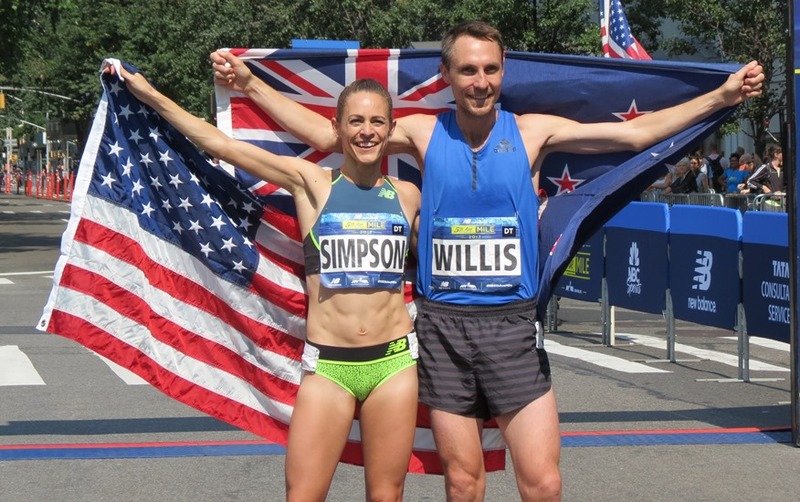 Both Willis and Simpson earned $5000 for their titles, which capped a day of 23 heats featuring a record 7664 finishers over a variety of age groups and abilities in the 37th running of the event. Sounds dangerous, but it’s really not. Runners almost never experience dehydration levels sufficient to cause major health consequences. But normal levels of dehydration will make you feel uncomfortable and cause you to slow down. Drinking while you run will limit these negative effects of dehydration. But what should you drink, how much, and when? In the past, athletes were encouraged to drink as much as possible during exercise, or at least to drink enough to completely offset dehydration (that is, to drink enough to prevent any decrease in body weight during exercise). However, it is now understood that this is bad advice, for two reasons. Firstly, it is possible to drink too much during exercise. Forcing yourself to swallow more fluid than your body really needs while running may cause gastrointestinal distress, and in extreme cases it can cause a dangerous condition known as water intoxication, or hyponatremia. Secondly, research has shown that drinking to completely offset sweating offers no advantage with respect to performance or body temperature regulation compared to drinking by thirst. The new exercise hydration advice is in fact to drink according to your thirst. As long as you keep an adequate supply of a palatable drink accessible during your runs, you will naturally drink enough to optimize your performance if you just drink as often and as much as your thirst dictates. Dehydration only affects performance in workouts lasting longer than an hour, so you don’t have to drink during workouts that are shorter than an hour. However, you can if you like. 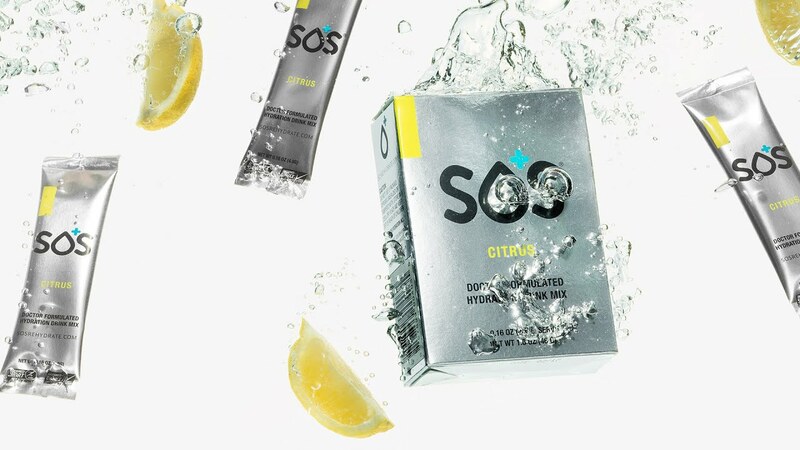 Plain water is adequate, but sports drinks like SOS Hydration offer a couple of advantages. Specifically, you’ll be able to replace the sodium and other minerals that your body loses in sweat along with water. In addition, with SOS you’ll absorb 3x more water than drinking water alone. Maintaining access to fluids during runs can be challenging. You can carry some fluid in a squeeze bottle stashed in a fluid belt worn around your waist, but you cannot carry enough fluid in this manner to cover your longest runs. To ensure that you have enough fluid to cover these runs, either plan to return home midway through the run to refill your bottle or do a bottle drop before your runs. Wearing a fluid belt will slow you down in your faster runs, so do these runs on a track or short circuit where you can stash a bottle at a convenient place and grab it for a quick drink as you pass by. And remember, don’t force down fluids. Drink when you’re thirsty.